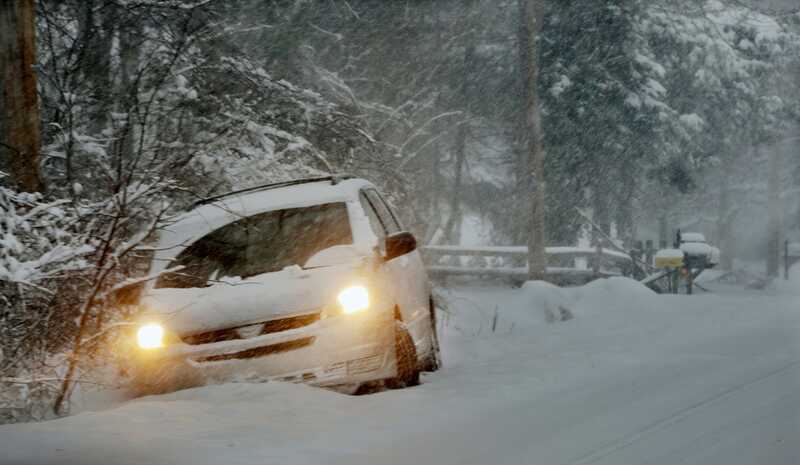 Mel Evans/APA car is stuck in the snow after skidding into a ditch in Yardley, Pa., Thursday, Feb. 13, 2014. — Pull off the highway and make yourself visible to rescuers. Turn on hazard lights and tie a bright cloth to your antenna or door handle. — Call 911 from your mobile phone, if you have one. Be prepared to describe the location, the condition of your companions and the trouble you’re having. Don’t hang up until you know whom you’ve spoken with and what will happen next. — Stay in your vehicle. — Stay calm. Don’t get hot and sweaty. Wet clothing loses insulation and makes you more susceptible to hypothermia. — Keep fresh air in your vehicle. It is much better to be chilly or cold and awake than to become comfortably warm and slip into unconsciousness. — Keep the exhaust pipe free of snow to avoid carbon monoxide poisoning. Run the engine at 10-minute intervals for heat and keep a downwind window cracked. — Turn on the dome light at night to attract attention, but only when running the engine. — Keep your blood circulating by loosening tight clothing, changing positions frequently and moving your arms and legs. Huddle close to one another. Use maps or even car mats for added insulation. — Take turns sleeping. One person should be awake at all times to look for rescue crews. — Don’t expect to be comfortable. The point is to survive until you’re found.